All participants will have the opportunity to contribute in a way that is comfortable to them, both during idea generation and decision-making. We will minimize unproductive discussion of disagreement and maximize productive discussion of disagreement. 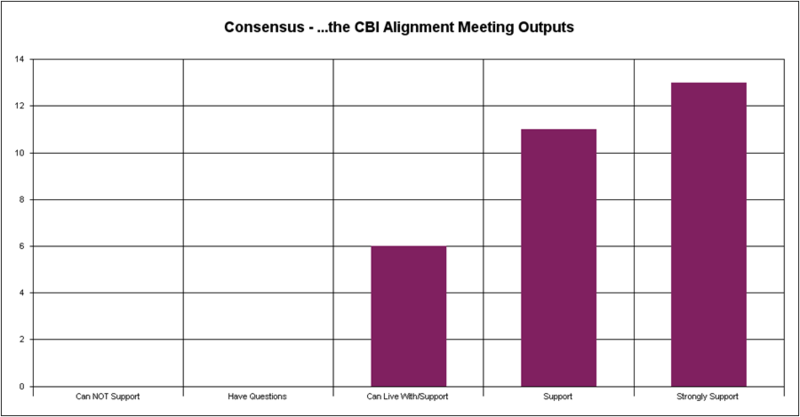 We will achieve a consensus that will be publicly supported by all participants. Prism delivers on this promise through the skilled application of group process techniques and the deft use of group decision support systems. Regardless of where they are in any decision process, groups generate ideas within the following three-step framework. The group is asked to respond to the idea generation cue by brainstorming silently and alone. This gives each individual — especially those who may be shy and reflective rather than aggressive and impulsive — the opportunity to generate ideas comfortably. Then, each member is asked to pair and share without judgment, stopping only to extend ideas or to seek clarification. After the pair-share, every participant is armed with ideas to contribute to the group list — either their own or their partner’s. Each subgroup then contributes to a group brainstorm where the deferral of judgment rules remain the same. The goal is that the larger brainstormed list will include a contribution from each member of the team. Thus, throughout the idea generation phase, all members are able to contribute in a way that is comfortable to them. After clustering the group brainstorm, the group can move to decision-making. Group decision support systems allow quick and powerful assessment of options: 1 – n ranking, paired comparison analyses, multi-criteria decision making, strategic profiling, among others. Each member is given a keypad that has the same weight as every other keypad; therefore, no member can drive the discussion or have a disproportionate impact on the outcome. The beauty of using collaborative technologies during convergence is their efficiency. Once the vote is complete, the system presents the results in graphic form (bar chart, scatter diagram, etc.). Furthermore, the results can be disaggregated by subgroups within the room. Immediately, the group can see where they agree or disagree. To their surprise, the most important insight is often the group’s discovery regarding how much they agree. The disagreement displayed objectively before them may have remained unspoken — that is, until the team has retreated to the parking lot or to the water cooler where such disagreement is spoken unproductively in hushed tones. This is where Prism delivers on its promise to minimize unproductive discussion of disagreement and to maximize productive discussion of agreement. Since the group sees explicitly where they agree, they can focus their discussions on where they truly disagree and do so efficiently. Our experience is that in a typical meeting disagreement is often expressed not to advance the conversation or to enrich the solution set; rather, most disagreement is expressed to satisfy individuals’ egos or to feed the voracious needs of turf-war dynamics. Finally, every implicit agreement is tested explicitly in a consensus process. 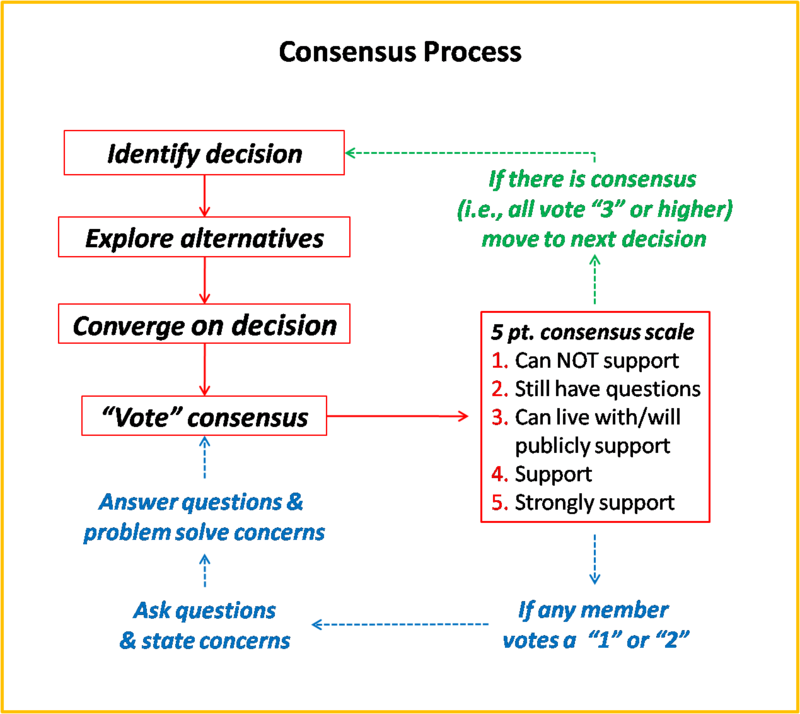 See the consensus process chart above and the sample consensus vote of a 30 member project management team for a prominent Fortune 50 company.